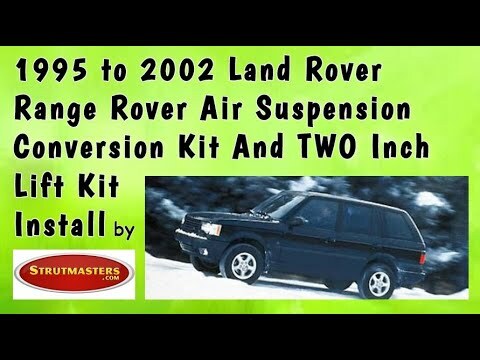 Strutmasters 2003-2005 Range Rover L322 Chassis Four Wheel Air Suspension Conversion Kit With Warning Light Module is the perfect solution to your air suspension problems. Designed to be very affordable, you can convert your ENTIRE air suspension to use passive struts and coil springs for less than the price of replacing ONE Original Equipment air strut. 2003-2005 Range Rover L322 Chassis 4 Wheel Air Suspension Conversion Kit With Warning Light Module (LB34BM) is the perfect solution to your air suspension problems. Designed to be very affordable, you can convert your air suspension to use standard. The answer is simple. Direct replacement of your failed air suspension system is very expensive. In addition to replacing obvious worn components like air springs and air struts, all of the electronic components will eventually fail. Converting to a passive non-air suspension is more reliable and way less expensive. Our conversion kit is assembled in America with quality and affordability in mind. Each kit includes two pre-assembled front struts with Eibach springs, two rear Eibach springs, and a Suspension Warning Light Elimination Module. It can be installed in about one hour per wheel. With our online installation videos, detailed instructions and available tech support, you may choose to do this yourself. 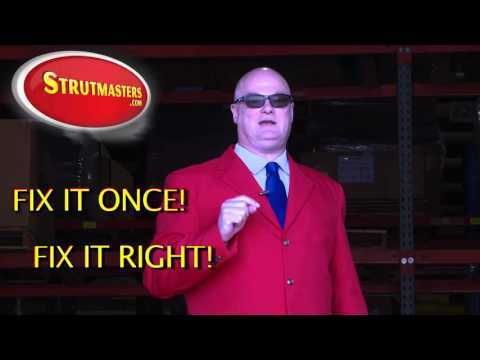 The Strutmasters kit is a fraction of the cost compared with Original Equipment direct replacement parts. 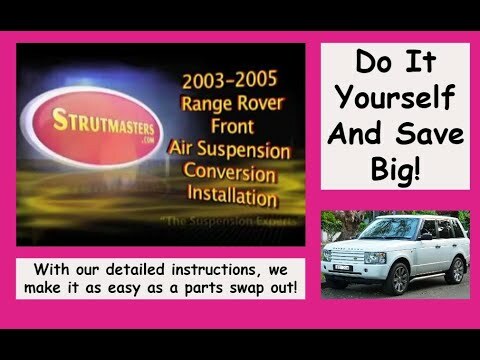 It just makes sense to get rid of your air suspension headaches with our Strutmasters suspension conversion kit. 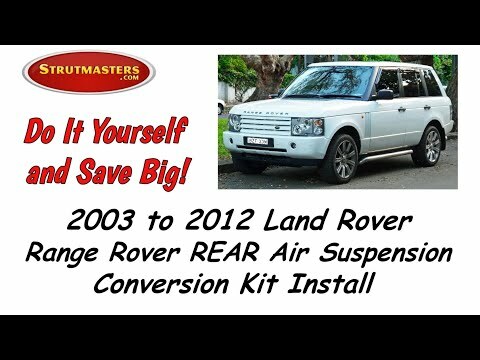 How Do I know If My Range Rover L322 Chassis Air Suspension is failing? 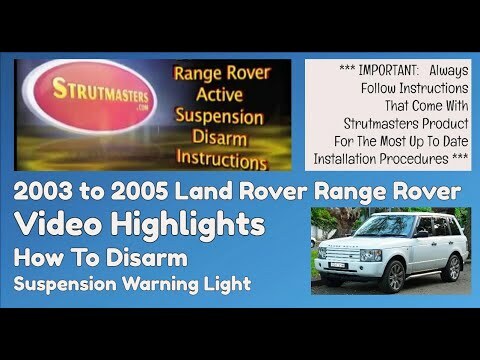 Early detection of a failed or leaking components is the key to avoiding total failure of the 2003-2005 Range Rover L322 Chassis air suspension system. Look for these classic signs to help you determine if this is occurring. First, check the ride height on your Rover. Are there any sudden and very noticeable changes? A drop of three to five inches of ride height is common. Do you see sagging on one side while the other is inflated? Does the rear or front of the vehicle look like it‚Äôs squatting down on the ground? If your suspension is failed or leaking, your air compressor will cease working or be overworked. Lastly, check your instrument cluster. Is there a suspension warning light illuminated? If any of these apply to your vehicle, there is a good chance you will need a replacement or repair. = TOTAL: Over $2,300 (and that doesn't even include replacing electronic components that are known to fail such as the height sensors). 2003-2005 Range Rover L322 Chassis Air Struts (x4)- struts that contain a rubber air bladder (spring) whose capabilities are managed by an electronic suspension control module. The strut portion reduces vibration and bounciness caused by driving on rough surfaces. The rubber air springs inflate to help maintain the vehicle's correct ride height. 2003-2005 Range Rover L322 Chassis Height Sensors (x4)- a linkage located near each wheel of a vehicle with any electronic suspension that, either mechanically or electronically, constantly measures the height of the vehicle, and reports this information back to the control module so that the computer can identify if changes in height need to be adjusted accordingly. The ride height sensor is a moving part, and like all moving parts, they will eventually wear out. 2003-2005 Range Rover L322 Chassis Air Lines- tubes that carry pressurized air from a compressor to the rubber air springs atop the air struts in order to adjust the height of the vehicle, respectively. 2003-2005 Range Rover L322 Chassis Compressor- creates and sends pressurized air to active suspension components. When the air suspension starts leaking, the compressor/pump starts working harder to try to keep the system inflated. By the time air suspension leaks down completely, sitting the vehicle on its tires, the compressor will either have failed or be well on its way to full failure. Buying replacement air struts and air s[prings and installing them, only to find out the compressor still needs to be replaced can be very frustrating, time-consuming, and expensive. 2003-2005 Range Rover L322 Chassis Dryer Assembly- used to keep moisture out of air lines and air springs in order to prevent freezing and internal cracking of these parts. Once air suspension starts leaking, moisture will build-up throughout the air system. Moisture damages the air suspension from the inside. The dryer will need to be replaced in order to eliminate the moisture and prevent any further damage. 2003-2005 Range Rover L322 Chassis Suspension Control Module- a computer which is responsible for the operations of the air suspension system and maintaining the vehicle's correct ride height. 2003-2005 Range Rover L322 Chassis O-rings- Although they are the least expensive parts of the air suspension, they are responsible for maintaining the seal where all of the air lines connect. Be sure to replace the O-rings when repairing any air suspension system.